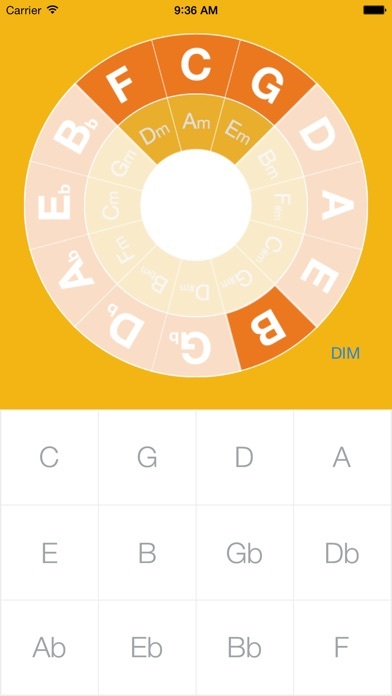 Circle of Fifths Lite allows you to quickly find the chord family and help you with what chords will work in a song while you are composing music. It's designed to assist you to understand chord progressions, easily convert music into a different key, compose new music, and interpret key signatures, scales, and modes. The diagram lines up the fifth note of each major scale as well as its relative minor and a diminished chord. Just swipe the wheel to get to the position you want. It is a handy tool for both amateur music theory enthusiasts and professional music composers. We are committed to continually improve Circle of Fifths and we welcome all suggestions for free future updates!